The only mainstream social network dedicated to business, LinkedIn is touted by many inbound marketers as an indispensable customer acquisition channel. Like all the big social networks, though, LinkedIn's platform is constantly in flux. Keeping on top of all the latest changes can be a major challenge. Are Linkedin Showcase Pages Right For You? When LinkedIn rolled out "Showcase Pages" last November, marketers were given an additional option for brand engagement on the social network. We could promote our offerings via Showcase Pages or the more traditional "Products & Services" tab on Company Pages. Then, a few months ago, LinkedIn announced that Products & Services were being phased out, forcing us to decide between Showcase Pages and nothing. LinkedIn users were outraged, but why? Showcase Pages allow marketers to manage their company's sub-brands with dedicated profiles. LinkedIn members can follow a Showcase Page in the same way they follow a Company Page. The LinkedIn database allows each company to create up to ten Showcase Pages. An electronics company, for example, could create different profiles for cameras, phones, and tablets – and could also create pages for customer service and tech support. Prospects, customers and fans can choose to follow the updates of the particular division that interests them without being bombarded with content they don't want. Showcase Pages have distinct LinkedIn Analytics profiles, too, so you can gain insight into the segmentation of your audience, growth over time and what posts are yielding the most impact. Before you get too excited about marketing with Showcase Pages, let's see how they compare with LinkedIn's older solution, the Products & Services tabs that used to be available on Company Pages. The now defunct Products & Services tab had a lot going for it. Companies used it to highlight their top offerings creatively, often including videos that demonstrated each product’s advantages. Some even leveraged this module to promote webinars, ebooks, free trials and other lead generation content. Smarter inbound marketers know the best marketing messages speak to a product's benefits rather than its specs, and the Products & Services tab was great for this. If you were marketing accounting services, for example, you could post "Saving You Money Since 2006" as a product. In fact, you could create up to 30 Products & Services content versions and serve up each version to specific user segments according to company size, job function, industry, seniority and/or geography. Users could easily recommend specific products, and the number of recommendations appeared next to each one. It was a great platform for promoting relatively static content and leveraging social proof alongside more dynamic, engagement-oriented posts, all presented to the user within the unified presence of Company Pages. Hubspot is a prime example of a company that leveraged the Products & Services tab on LinkedIn with great skill. Although their main product is software, Hubspot also offers free ebooks, which they use for lead generation. Until recently, they marketed each one of these ebooks as a separate product on LinkedIn, so each one could have its own thunder and garner its own recommendations. Without recommendations, segmenting, or opportunities for creative static messaging, Showcases are super weak in comparison. Many companies invested significant time and money over many years into maintaining their product listings and acquiring recommendations. All that work is now useless. Showcase Pages do display parent company relationships in the right-hand column, but their post feeds are completely separate. From a marketer's perspective, Showcases only make sense if you can dedicate enough time towards consistent posting on their dedicated pages, as well as on Company Pages. Is it even worth it for non-enterprise companies to work with Showcases? Are Showcase Pages Right for Your Company? Clearly, Showcase Pages aren’t for everyone. To decide if they're right for you, ask yourself if your audience really consists of distinct segments, each of which needs dedicated messaging. Don’t create artificial segmentation just for LinkedIn, your audience will see through that. If you only have one or two products and they have similar target audiences and buyer personas, it’s a waste of resources to maintain separate profiles with separate audiences and post feeds for each one. Just make sure the audience for each segment is large, vocal, and different enough to warrant a separate page. Keep in mind, though, that you should only set multiple Showcase Pages up if you have the resources necessary to keep them all active. There are few things more off-putting to prospects on social media than stagnant presences. Adobe is a great example of a company clearly excelling at marketing via Showcase Pages. Adobe offers several extremely different lines of products – Creative Cloud is for media creation, Digital Publishing Suite is for content management and Marketing Cloud is for distribution management and measurement – and each one has its own audience and own set of concerns, goals and values. Each Showcase has its own style of engagement that speaks to what's important to each segment. Another oft-cited example is Mattel's relatively new Showcase Page for Barbie, a brilliant branding move for a toy that has been criticized for emphasizing outdated values among women. 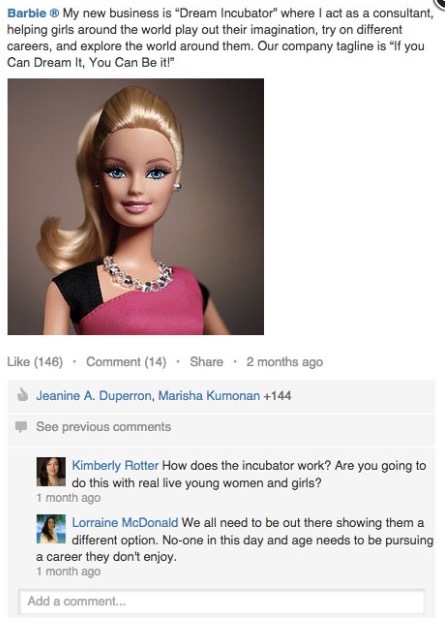 Since the company manufactures so many toys, with Barbie one of the most significant, it makes sense to build a community of Barbie fans that are self-selected to be career-minded. Updates on the page are written in the first person, as if they were posted by Barbie’s character. They range from messages of female empowerment to updates to the product line itself and its reach around the globe. Finally, Hewlett-Packard is primarily known as a manufacturer of computer products for consumers, but the company has been undergoing some major pivots lately, now emphasizing its lines of enterprise business solutions, innovation research, financial services and more. HP maintains an active Company Page on LinkedIn alongside no fewer than ten dynamic Showcase pages that serve as sub-communities. The Showcase for HP Labs, for example, features updates on the latest research, opinion pieces and profiles of colorful team members involved with especially amazing projects. All three of these examples are large companies that have the resources necessary to actively and sustainably maintain multiple Showcases, and your company might or might not be similar in this regard. However, there's still a lot that marketers for any company can learn from the big guys, and ultimately, the decision to get involved with a particular marketing platform should always be tackled on individual bases. Are You Going the Way of the Showcase? Showcase Pages are still too new for us conclusively decide whether they are worthy replacements for the old Products & Services tabs. On the other hand, Products & Services are apparently gone forever, so inbound marketers are probably better off letting go of the past and instead pondering to what extent Showcases do or don't represent opportunities for engaging segmented audiences with value. Large companies that are committed to "winning LinkedIn at all costs" can drive major impact using Showcases, while moonlighting independents with limited budgets and time availability are probably better off with Company Pages serving as their main bases of LinkedIn operation. The rest of us are left somewhere in between.